Sort / order for brushes, styles? Is there a way to order brushes, styles and the like? I´d probably like alphabetic sort, if possible after the default lists coming with the product. However, I´d really like a manual sort order: they always add to the end on import, but I like and use some more than others... Looked in both AP and AD, performed forum searches, didn´t find any clue alas. I tried that, without any success so far. 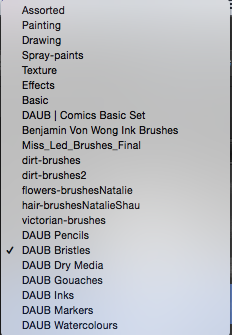 Probably lack of a correct description: it´s the list of brushes that I´d like to order, not the brushes included in a specific category (which can be dragged indeed). For instance, let´s say I ´d like to put all DAUB items in the list below in alphabetical order right up to the top, but under the ones already included in the product. Can I drag them somehow as well, or do I indeed need to raise that as enhanced feature request (same for styles)? Thank you Callum, I´ll do that.